Cottonwood is a good looking and durable wood. Even though it is relatively soft, it holds up well. Settlers heading west used it for most everything. This bowl holds a goodly amount of 5 cups measured to the brim. The natural light color mixed with the grays make this attractive. I think you find this fits into most decors. The bowl is 9 ¼” in diameter, 2 ¾” high and has a depth of a little over 2”. The bottom has a slight concave to it so that makes it just right. The wood was first sealed with food grade walnut oil and then finished with a mixture of walnut oil and shellac. This combination gives the bowl a nice hard long lasting natural finish. 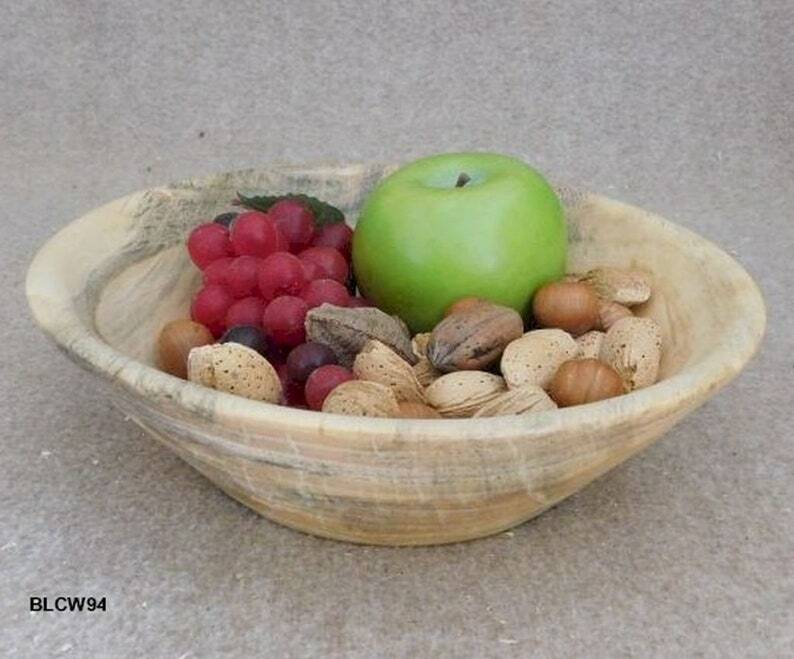 This bowl will work very well as a medium sized serving bowl, display bowl for fruits and nuts, or even a popcorn bowl. 2May18 BLCW94 Free shipping within Continental United States only. I have no idea what number purchase this is, that I have made from Dave over the years, because there have been so many. However, I do know that it has the same high quality craftsmanship and materials, that keeps me coming back. Thanks again Dave. High quality barware piece that handles just as superbly as it looks. Love this cute bowl! Shipped fast and well wrapped. Will buy more from this wonderful artist. I will accept PayPal and Etsy Direct Checkout. Simply put, I have and always will stand by my work. If you feel I have misrepresented my work, by either description or photos, let me know how I did that and I will take care of it. If I do need to do a refund, I expect to receive the pieces that you bought first for inspection. I do not refund shipping fees of any kind. After 30 days from when your purchase was shipped I will not issue a refund for any reason. The 30 day timeline was established as that is when all shipper insurances have expired. All refunds are done through the same method the item was purchased. I always ship my products by USPS unless requested otherwise. Most everything goes Standard Post. I do try and keep the shipping costs down. Thurs & Fri and shipping days. With the rise in fuel, boxes, bubble wrap, and other such items it takes to make sure your piece arrives as we both want it to, then this has to be considered in the costs. If you prefer to have your piece shipped priority only, let me know and I will recalculate the costs with your zip code. If I feel I ended up charging you too much I will certainly refund those monies back to you. But, please also keep in mind that these are wood products which do have some weight to them so the costs are accordingly. All prices posted are for the Continental United States only. If you are in Alaska or Hawaii, or in another country please contact me for with your zip code for shipping costs. Custom Orders: From May22, 2018 on I will no longer take custom orders unless you are an established repeat customer of mine. Sorry to have to implement this policy, but I have left hanging out to dry too many times now. I used to pride myself on being one of the few turners that take custom orders, but that has been abused now too many times. Thank you in advance for your understanding.